The SHO! KIDS Jacket is a jacket pattern with an asymmetrical front Zipper and cowl neck. It has a comfortable fit and a sufficient length for Kids playing around. A nice eyecatcher are the optional inserts at the shoulders and sleeves. 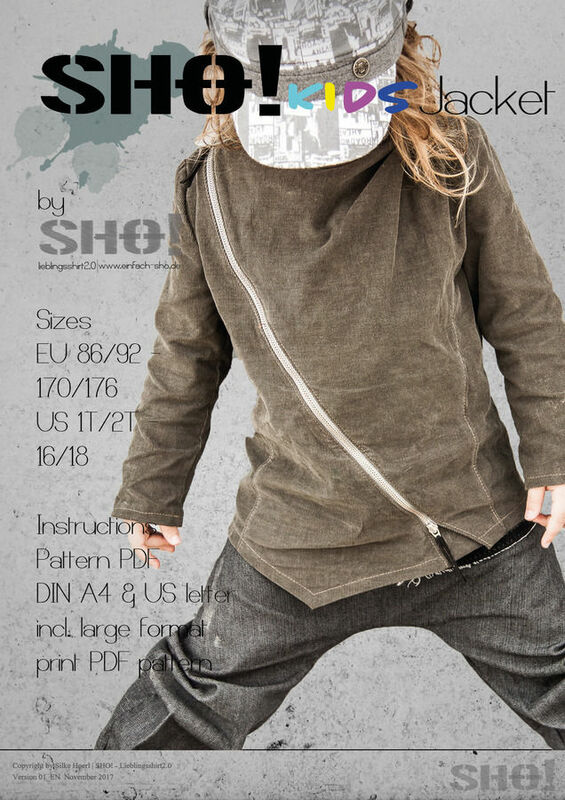 The SHO!KIDS Jacket is for non-stretchable fabrics, such as denim, canvax, cord, (faux) leather, etc. but we had some real nice results out of Stretch fabrics as well. The eBook covers the sizes EU 86/92 - 170/176 and US 1T/2T - 16/18. It includes an illustrated instruction, PDF pattern files in DIN A4 and US letter format as well as several large printing file PDFs. All with metric and imperial measurements.